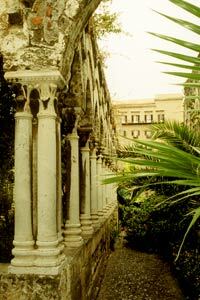 Walk the streets of Palermo. 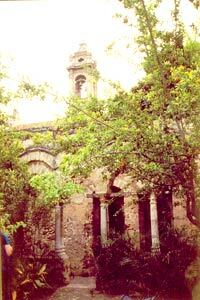 Then given yourself a break and visit San Giovanni degli Eremiti, or the Church of St. John the Hermits. It is located near the Royal Palace. We enjoyed our time there in 2003. This is the remains of a cloister, and it is now a very pleasant small park. The church is of 12th century Norman-Arab construction. It was built upon a mosque. That may be one of the reasons for its Arabic style with five reddish cupolas. Roger II initiated the construction for the Benedictine Order in 1130. Books report he asked for the domes to show his support for Arab influence in the architecture of Palermo at the time. The bell tower is the only part that has a distinctive Norman appearance of Gothic lines and mullioned windows. The elegant cloister was probably added in the 12th or 13th century and constructed in the Romanesque style. The Church of St. John of the Hermits is open Mondays through Saturdays from 9 to 1 and 3 to 7. On Sundays, the Church is only open in the morning from 9 to 1. There is a nominal admission fee.